Frooty Licious is a wonderful and vibrant online slots casino game that opts for the non-standard 3 reel approach. 3 reels have a tendency to be more catered towards to the cute and cautious slot gamer but this one certainly has its bonus points. Spin and Deposit today, and match traditional fruit machine symbols from apples to bananas and bells. Eyecon ensures that it’s always in the lead of the online casino industry by putting in the extra effort to offer players an experience they will enjoy and delight in. For 20 years, they have been broadening their portfolio with unique, diverse and exciting slot experience designed with utmost care and dedication when it comes to graphics and gameplay. 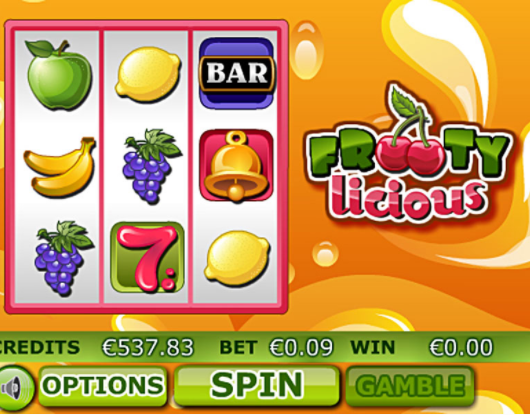 Frootylicious is a thrilling slot game packed with delicious and valuable fruit, reminding of the classic slot machines, while still maintaining a modern touch. You can discover more about more Eyecon games on Easy Slots here. The world can seem to be a bleak and boring thing sometimes when you can no longer see the excitement in it. However, Frootylicious is here to brighten you up and recolour your life with vibrancy and fun. The sleek graphics convey a minimalistic, yet charming design, perfect for anyone who’s tired of too much complexity in slot themes. In this game, you can go back to the classics and enjoy the simple pleasure of betting and win. Frootylicious has 3 reels and 3 rows, along with 9 paylines. The energetic purple background stands out and is visually pleasing, while the symbols perfectly complete the theme. There’re lots of betting options to choose from. You can adjust the number of active paylines, between 1 and 9, and place a bet starting from 0.01 credits and going up to 1.25 credits. However, remember that the more paylines are active, the bigger the chance of winning becomes, and the more you bet, the more you can win. Despite the fact that you’d expect such a simplistic game to have a lack of features, the opposite is true for this slot experience. The Wild Card of Frootylicious is the Lucky 7 symbol, which substitutes any other symbols, beside the two Scatters, in order to form more winning combinations, adding to your delight. The first Scatter of the game is the Bar symbol. When you spin 3 of them anywhere on the reel, you are rewarded with 8 Free Games, during which all wins are multiplied by 3x. You can also retrigger Free Games a maximum of 15 times. Furthermore, for each Scatter, only the highest win is added to the line wins and they are multiplied by the total wager. The shiny Bell symbol is the second Scatter and when 3 of them appear anywhere on the reel, the Prize Pick Bonus is triggered. Then, you are awarded 3 picks, which can maximize your initial bet by 111x. The prize of each pick is collected and they are awarded together at the end of the Bonus feature. If you're interested, more Easy Slots promotions are shown here, claim your free spins now.